High-Quality and Affordable Rip Rap & River Rock Services on Lake Norman, Mountain Island Lake, Lake Hickory, Lake Wylie, Lake Rhoadhiss, High Rock Lake & Lake James! Living by a body of water can be a peaceful and enjoyable experience. 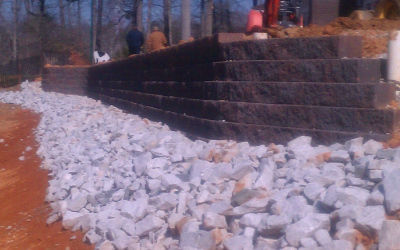 We Can Help With Any Retaining Wall Project on Lake Norman, Mountain Island Lake, Lake Hickory, Lake Wylie, Lake Rhoadhiss, High Rock Lake or Lake James! Retaining walls serve an important purpose for any home landscape that is near a body of water. We Can Build a Custom Seawall Solution For Any Property on Lake Norman, Mountain Island Lake, Lake Hickory, Lake Wylie, Lake Rhoadhiss, High Rock Lake or Lake James! If you live in Lake Norman or its surrounding areas, you are likely able to take advantage of the beautiful views and scenery. 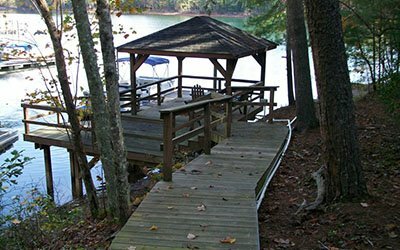 We Can Create or Repair Your Docks & Dock Systems on Lake Norman, Mountain Island Lake, Lake Hickory, Lake Wylie, Lake Rhoadhiss, High Rock Lake & Lake James! Living on or near a lake such as Lake Norman in North Carolina can be a luxurious and enjoyable experience. New Dock Ramp and Walkway At Renegar Construction, we have the skill and expertise you have been looking for in a marine construction and repair company. Are you looking for a reliable company that specializes in seawalls, floating docks, dock systems, boat docks and much more? If you live in the Lake Norman, North Carolina area, you’re in luck. Renegar Construction has been in operation for 15 years. Our company has established itself as the leading provider of anything related to marine projects and construction in North and South Carolina. The difference between Renegar Construction and our competitors is that we oversee every step of the process. From planning, design, engineering, and construction, all the way up to the final revealing of the project, we do it all. 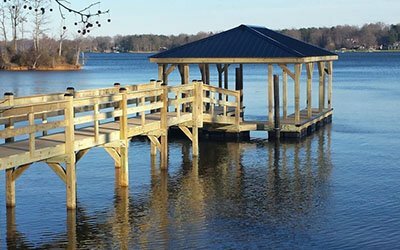 Many residents of the Lake Norman area are anxious to get a new boat dock, seawall, rip rap wall, or retaining wall built as quickly as possible and at an affordable price. The dock builders at Renegar Construction promise that our services will be efficient and competitively priced. However, be aware that constructing a new pier, boat dock, dock, rip rap, seawall, or retaining wall should be seen as an investment in your property. Making a significant investment in the construction work we do will ensure that your new dock systems, boat docks, floating docks, or seawalls function properly and remain in great condition for many years. Many marine construction companies in this area make the mistake of sending their employees out on a job without the consultation or management of the owner of the company. Unlike other marine construction companies in the area, our owner constantly oversees every job we complete, from boat dock repair,and dock flotation to pier construction, to ensure that it is done with precision and constructed properly. When you present to us a job that you’d like us to do, you can be guaranteed that we will be willing to do it and go above and beyond your expectations. For us, there is no such thing as a marine construction job that is too large or too small for our expertise. For construction and repair of boat docks, docks, seawalls, and retaining walls, don’t go anywhere else but Renegar Construction.